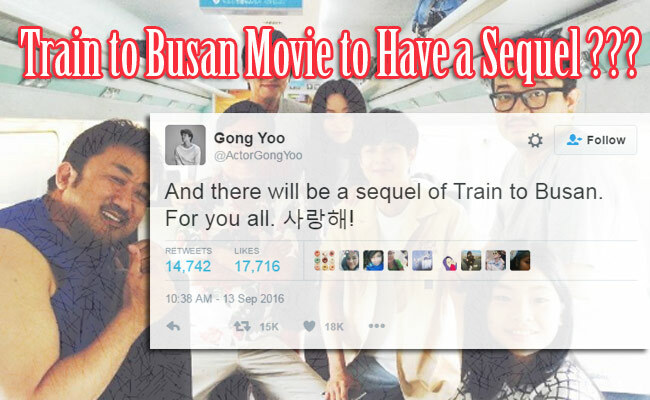 Korean hit movie “Train to Busan” is reportedly having a sequel according to its lead actor Gong Yoo. He confirmed this news through his official twitter account @ActorGongYoo last September 13. Aside from revealing the exciting news, the Korean actor also thanked the love receive by the movie worldwide. He also posted photos together with the cast. Upon learning this, the fans were ecstatic to know what is going to happen on the sequel. There were also reports that the producers from Hollywood such as Sony Pictures and 20th Century Fox while France have Canal Plus, EuropaCorp, and Gaumont are all eager to buy the rights to remake the Korean film.According to Variety, there is no final deal yet but major studios and indie productions from US and France are interested to remake the film. And there will be a sequel of Train to Busan. For you all. 사랑해! Danny Lee who is senior manager of Contents Panda revealed on his interview with Hollywood Reporter that they are not rushing to deal with this big studios. He also added that French filmmakers and viewers can relate to the story because bullet trains are also a big part of their daily lives. Train to Busan is a zombie apocalypse thriller film directed by Yeon Sang Hoo. It is about a group of people trying to survive in a zombie apocalypse while they were trapped on a train routing from Seoul to Busan. It first premiered at the Cannes Film Festival last May 13 where it receives a euphoric praise from viewers and critics. It eventually became a hit on their local cinemas with more than 10 million moviegoers, a first Korean film to break the audience record in 2016. Because of the movie’s success, it has a prequel animated film “Seoul Station”. The movie was also compared to another zombie thriller “World War Z” starring Brad Pitt. As of this typing, the hit film now earned a total of $99 million worldwide.